"Fans of the TOONED series are in for a fun and exciting ride"
FAIRFAX, Va.--(BUSINESS WIRE)--ExxonMobil and McLaren Mercedes are teaming up again for another installment of the McLaren animated TOONED series that focuses on the benefits of Mobil 1™ synthetic motor oil and celebrates the 20th anniversary of the technology partnership between the two organizations. The new, short animated film – TOONED presents… Mobil 1 - Oil: An Odyssey – is available beginning Friday, May 23, 2014 via mobiloil.com and the Mobil 1 YouTube channel at youtube.com/OfficialMobil1. Created with the award-winning Framestore production team, the latest animated short film brings together familiar members of the Mobil 1 Racing team -- Formula 1 World Champion Jenson Button, three-time NASCAR Sprint Cup Series Champion Tony Stewart and, making his animated debut, the ‘new kid on the grid’ McLaren driver Kevin Magnussen. The drivers join the genius Professor M on a new set of adventures as they learn more about Mobil 1 synthetic motor oil. Presented in three two-minute episodes, the new movie features the three drivers taking a fun and informative journey through the technological benefits of Mobil 1 synthetic motor oil covering molecular engineering, viscosity and extremes in temperature. Eager to prove himself, Magnussen rises to the top of the class during Professor M’s technology briefing with some hilarious quips and superior motor oil knowledge. 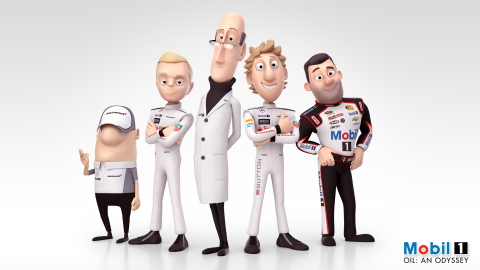 Since the launch of McLaren’s TOONED in 2012, the animation has captivated fans around the world. 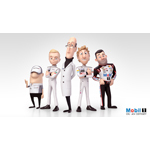 Fans can use Twitter hashtag #Mobil1TOONED to join in on the conversation. The new film will be released in Russian and Mandarin Chinese this summer. New Zealand racing driver Bruce McLaren founded the McLaren team in 1963. Since 1966, when it entered its first Formula 1 race, McLaren has won 20 world championships and over 180 grands prix. McLaren is now globally renowned as one of sport’s most successful competitors and as one of the world’s most illustrious high-technology brands. The McLaren Group has grown to encompass much more than just grand prix racing: McLaren produced the 1990s’ original supercar, the McLaren F1, and, with the launch of McLaren Automotive, has gone on to introduce the internationally acclaimed 12C, 12C Spider and McLaren P1™ high-performance cars. The McLaren Mercedes team campaigns the 2014 FIA Formula 1 World Championship with the driver pairing of 2009 world champion Jenson Button and Denmark’s Kevin Magnussen. They drive the McLaren Mercedes MP4-29.